I think that being in school gives children the right of passage to become sick. It never fails! School aged children get around eight to twelve colds a year, my children always seem to meet that statistic. Andrea is combating her first cold of the season and I’m sure it will be passed onto her brother next. When a cold can last anywhere from six days to two weeks, it’s important to get them back on track as quickly as possible. Specially around the holidays! One battle that we often face when giving the kids medicine is their dislike of the taste. The first dose goes down slow, but it goes down. The subsequent doses are harder and then you have to deal with half taken doses. Treating a cold with incorrect doses isn’t going to speed the healing process up and it’s frustrating as a parent to struggle with it. 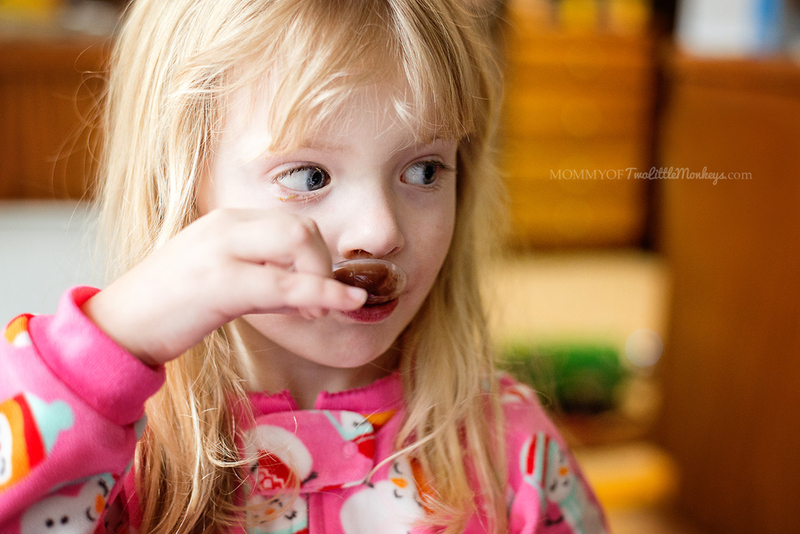 This is when we heard about Dr. Cocoa for children, the first-ever cough and cold medicine for children with patented formulas combining trusted, effective ingredients with 10% real cocoa for great chocolate taste to make giving medicine to kids easier. 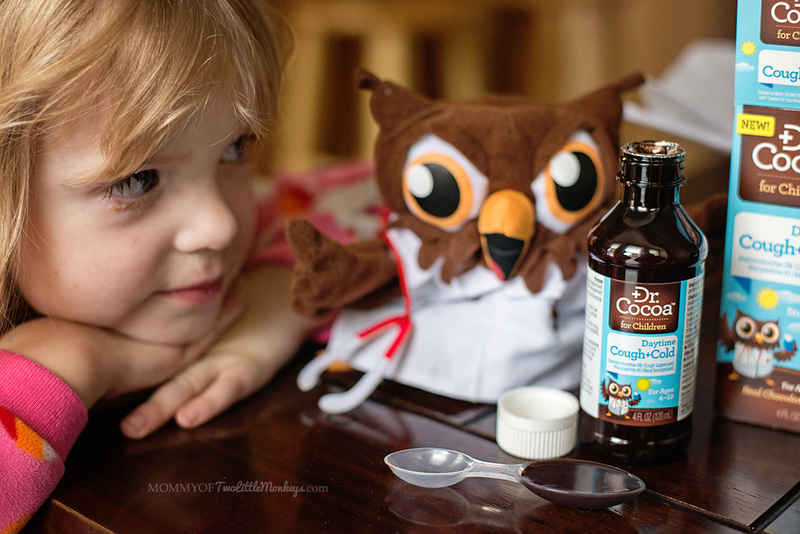 Andrea is 4 years old, so we turned to Dr. Cocoa to treat her stuffy nose and cough with the Dr. Cocoa Daytime Cough + Cold Relief. • Dr. Cocoa™ Long-Acting Cough Relief: relieves coughs for up to eight hours without causing drowsiness in children ages 4-13 (active ingredient: Dextromethorphan). Follow the package label for exact dose by age, or speak to your child’s pediatrician. 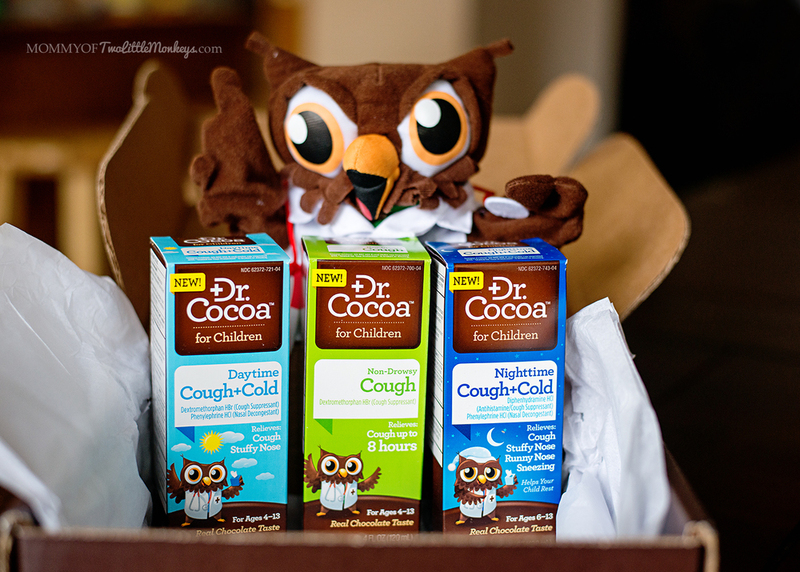 • Dr. Cocoa™ Daytime Cough + Cold Relief: relieves stuffy nose and cough for children ages 4-13. Its non-drowsy formula makes it ideal for daytime use (active ingredients: Dextromethorphan and Phenylephrine). Follow the package label for exact dose by age, or speak to your child’s pediatrician. • Dr. Cocoa™ Nighttime Cough + Cold Relief: Made especially for children ages 6-13 to relieve coughs, along with stuffy nose, runny nose and sneezing at night (active ingredients: Diphenhydramine, Phenylephrine). Follow the package label for exact dose by age, or speak to your child’s pediatrician. Dr. Cocoa’s soothing, real-cocoa formula was developed to improve dosing compliance among children – it triggers a smile, not a struggle. It was nice to have a moment of being able to give her medicine without a huge battle. It’s been a few days, we’ve used a few doses of Dr. Cocoa and our little girl is close to being back on her feet.